In the past couple of weeks, Occupy Wall Street has spurred dedicated education activists into some of the most innovative and inspiring actions. 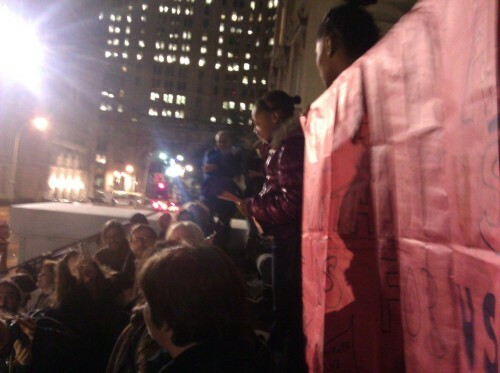 Jordan is 13, and she’s speaking to a crowd of mostly adults, sitting on the granite steps of the New York City Department of Education at Tweed Hall. Or rather, she is speaking through them, as her words echo through the people’s mic used at Occupy Wall Street just few blocks south from where she’s speaking. 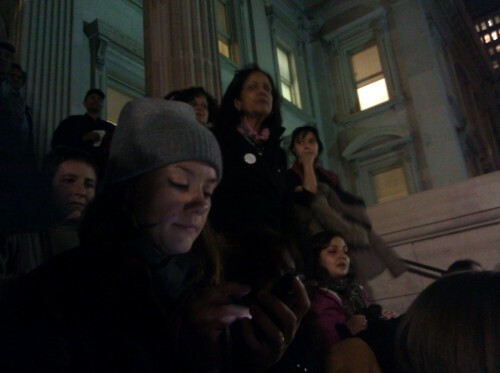 Tonight the steps of the DOE themselves have been occupied and are packed with teachers, students, parents, and supporters holding a general assembly on the state of public education in New York. Jordan was far from the only student to speak. 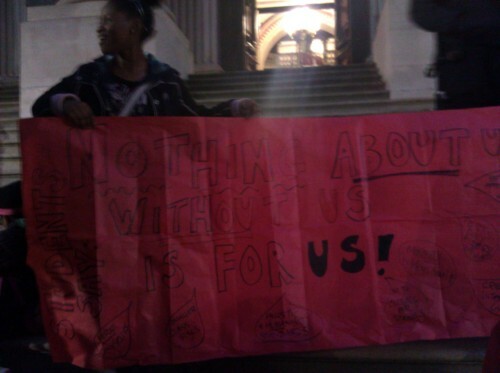 A young girl holding up one end of a sign that read “Nothing about us, without us, is for us!” declared “I am angry! I am PISSED! 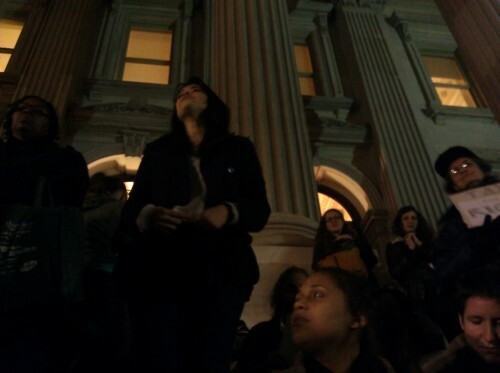 And I want JUSTICE!” in ringing tones, and Devan, a poet, read a poem over the people’s mic. Perhaps the most remarkable thing about this event was the way in which it brought together those who might be considered adversaries in a conversation about the things they feel are hurting schools. Students spoke about the pressure of high-stakes testing, but also of their teachers’ hard work and low pay. Teachers worried that their students were not learning because they were cramming for tests, and parents called for teachers to be supported, not threatened. Rosie Frascella, a teacher and one of the organizers of this general assembly, told me before the event happened that invitations to speak had been issued to Mayor Mike Bloomberg and Schools Chancellor Dennis Walcott. “If Chancellor Walcott and Bloomberg choose to show up, they will have the same opportunity to speak as all of us, and to show them what a democratic process looks like, because obviously they don’t know,” she said. The first Occupy the Department of Education (Occupy the DOE) action took place on October 25 at the Panel for Educational Policy’s regular public meeting where teachers, parents and students are invited to speak to the city’s education policymakers—but on the policymakers’ terms. 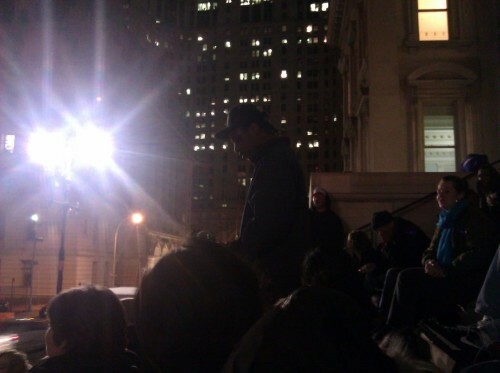 “The PEP represents the struggle of OWS in many ways. The PEP is essentially mayoral control, the mayor appoints eight out of 13 panelists, so whatever Bloomberg decides, he makes sure that his panelists vote in alliance with his beliefs. It’s very clear who the 1 percent is in education: Bloomberg and Chancellor Walcott. The rest of us feel like the 99 percent: teachers, students, and parents,” Frascella said. She noted that Mayor Bloomberg renewed a $120 million contract with Verizon while 45,000 of its workers were on strike, and when the company was already involved in a scandal around fraudulent billing—in August, Manhattan Borough President Scott Stringer called for the return of $800,000 to the city from Verizon. “We don’t have mayoral control in white suburbia, you only see policies like these in urban settings,” Frascella said. And the drive toward more charter schools led the Grassroots Education Movement (of which Jones is a part) to create a documentary called The Inconvenient Truth Behind Waiting for Superman, to push back against the seemingly endless flood of pro-charter-school media. “I think there’s certainly a critical mass of consciousness–a critical mass of people who through their direct experience with so-called education reform have come to figure out that this is a wolf in sheep’s clothing,” Jones said. The group held a meeting at one of their grade-ins and decided to take their movement to the PEP, and gathered supporters to join them. And so on October 25 over 200 parents, teachers and students headed for the PEP meeting, unsure of what would happen, but determined to make their voices heard. Eventually, the panel, including Chancellor Walcott, left the room, while parents and teachers and students (including 8-year-old Adriana, who told the meeting about her crowded class of 28 students) continued to hold their teach-in on the state of New York’s schools. 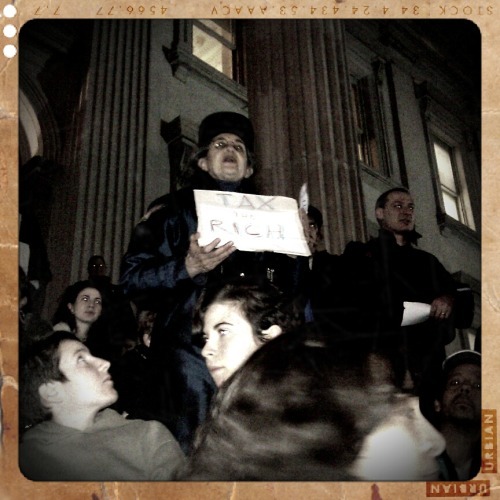 As Occupy Wall Street has grown and spread, working groups within the movement have explored ways to use its direct action tactics in different places to different ends. This was one of the first times the People’s Mic itself was used as a tactic for occupying a space—which was later done to great effect at a speech by Wisconsin Governor Scott Walker as well. “[Chancellor Walcott] tried to spin it like we were taking away the voices of the parents. But we brought out more parents than he did,” Frascella noted. “We’re moving toward a system the same way they did for Wall Street, they want the deregulation of education. They want to get rid of pesky union contracts and let the free market rip. It’s not going to be shocking that we see all kinds of scandals blossom,” Jones said. But teachers have been at the heart of the resistance that’s sparked in this country this year, from Wisconsin to Wall Street. Jones noted that despite what wound up being a loss in Wisconsin, teachers are very proud of the leading role that Wisconsin’s educators played in fighting back against union-busting. School reformers like Michelle Rhee, who recently charged a university $35,000 for a speech, have claimed success for charter schools—Rhee wants to raise $1 billion to fight teachers’ unions. But as Jones noted, scandals have been erupting that disprove some of the claims of success—and the teachers I spoke with feel the system is working just fine for education’s 1 percent. So what can be done? Can Occupy the DOE become a movement that spreads, like its parent movement, around the country and changes the way education conversations happen? “The students are really excited about Occupy Wall Street and are interested in it,” Frascella agreed. Still, the New York crowd was elated on Monday night at the Department of Education, the students thrilling to the feeling of speaking to a crowd and having their words repeated back to them with the same gravitas as their teachers and parents. 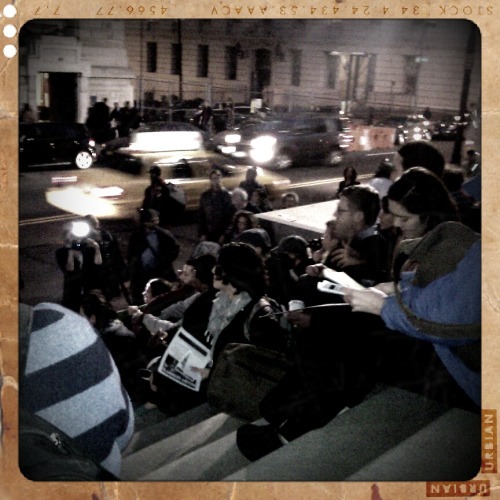 Plans for splitting Occupy the DOE into working groups to plan strategies and more actions going forward were discussed at the general assembly, and on Sunday, Nov. 13, the group will be meeting at 60 Wall Street at noon to plan those working groups. Sarah Jaffe is an associate editor at AlterNet, a rabblerouser and frequent Twitterer. You can follow her at @seasonothebitch.